“Dirty coils reduce the system’s ability to cool your home and cause the system to run longer, increasing energy costs and reducing the life of the equipment.” Energy Star Maintenance Checklist http://www.energystar.gov/index.cfm?c=heat_cool.pr_maintenance. During normal operation of an HVAC system, contaminates and particles enter through the air and build up on the coils. This buildup hampers the system’s effectiveness and shortens equipment lifespan. Constant cleaning of coils by personnel is expensive and time-consuming, and often results in a trade off. Either more money must be spent on preventive maintenance, or more money will be spent on energy costs and replacement. For this reason, having dirty HVAC coils is seen as unavoidable. 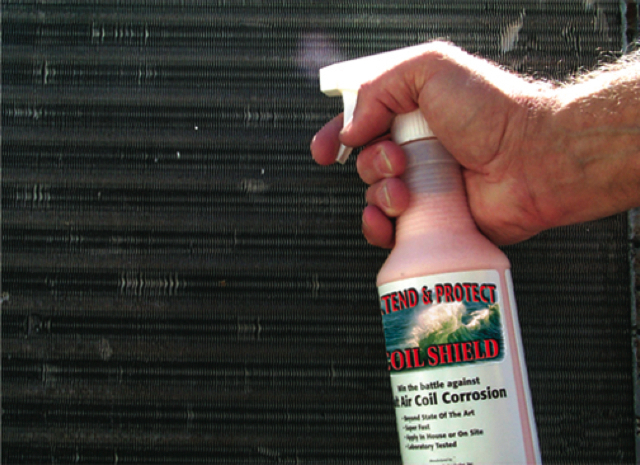 For treatment, there are numerous coil cleaners including non-acidic, non-caustic and foaming. While all clean the coils at different levels of effectiveness, they essentially are only momentarily effective. Once the system starts back up, buildup begins again until the next cleaning. For this reason, an effective maintenance plan includes applying a preventive product that deters contaminate accumulation. Remember, we value your experiences and welcome any comments you may have.